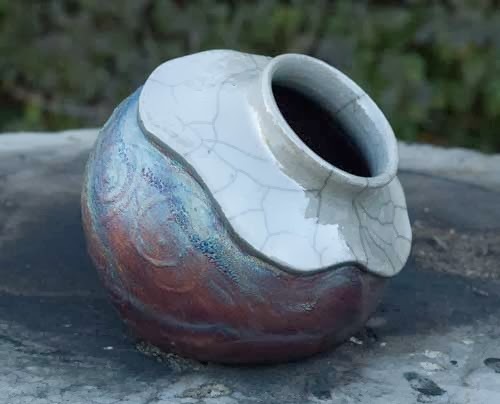 Still having fun with the copper matte luster glaze from Alternative Kilns & Firing Techniques . With the last firing, three pieces went in and three came out, intact and with good color. Which makes for a good day. 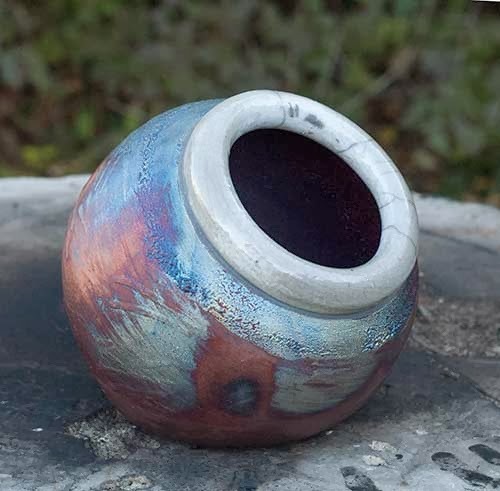 One of the things that makes raku firings exciting is the remarkable chance for failure. You have a piece that goes from about 1800 degrees Fahrenheit to nothing is seconds and that shock leads to breakage and structural failures. But it also leads to your brilliant colors and crackle or antiquing effects. So is it worth it? I think so even though another recent firing had four pieces in and only one survived. Frustrating but you just have to shake it off and move on. Avoiding expectations is also a good practice. I can't count the number of times I was sure a piece had all the qualities of a "sure thing" and fell to pieces the minute I touched it with tongs. Then others that I took a chance on and expected to fail survive spectacularly. So each firing is a exercise in letting go and accepting what happens as what needed to happen. It's become a mediation of sorts in its own right. But having said all that, I was pretty confident of this batch. The shape is inspired by the Hopi sipapu and my own interest in "primitive" spirituality and prehistoric art. I think it's interesting to have a representation of "where we came from" on hand in terms of the Hopi tradition and find it fascinating that most shamanic traditions of the world also speak of journeying through tunnels to visit the lower or upper world to look for wisdom and healing. 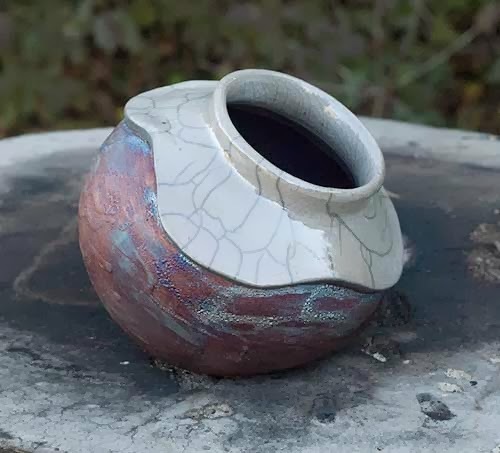 The way the copper glaze creates an alligator-like crawl on the interior of the pots reminds me of caves and tunnels and places mysterious and unseen. So I'm not sure what to call them. I'm not arrogant enough call them sipapus since I'm not Hopi and that wasn't the only source of inspiration. I would like to associate them with the idea of the shamanic journey but nothing I've come up with sounds right so I think I will leave it to the viewer if a name is even required. But I plan to do more of these so maybe a name will come later. In other news, the cinnamon mead is racked again and I had a taste. It taste like cinnamon but will require some backsweetening which is fine. The peach mead is bottled although I still wasn't tasting peaches but the overall flavor was very deep and only a little harsh. That harshness will ease with aging. I still want to move to bigger batches but time is against me. And speaking of time, you'll recall my little experiment that involved giving up coffee for the sake of meditation. Well, I'm still off the coffee and partake only of green tea and iced tea for lunches but the challenge is increasing as the holiday chaos kicks in and extra energy is needed. I will say that I missed coffee this past week when deadlines loomed but I still enjoy the benefits of going with out it. I've also tried some green tea energy smoothies and find them to be worthy substitutes for an energy drink. I have a friend who is a nutritional coach and fellow yoga-nut and we brainstormed one night and came up with some ideas for ingredients and I can report that the green tea smoothie is now the remedy for emergency energy without all the crazy chemicals. She blogged the recipe and concocted another energy mix that I have yet to try but sounds delicious. Once again, simple foods seem to be the solution to a whole lot of things.